On December 10, 2001, after the first snowfall in Beijing, Li Ju and Yang Ying said farewell to the national team. We were very surprised when we heard that the two players were Jiangsu province had submitted their resignation. Even though they were no longer very young, they had accomplishments in 2001. In Osaka, Li won the team and doubles titles while Yang won the team and mixed doubles titles. Based on their abilities, we had expected them to play at least in the 2003 Worlds. But if we look deeper, their decisions are understandable. About two years ago, Li had mentioned plans to retire after the 2001 Worlds. She joined the national youth team in 1991, and the main team in 192. In the past 11 years, she was in 5 Worlds, and was world champion 7 times. In the past 2 years, injuries and illnesses had repeatedly bothered her. She felt that she no longer had the capacity to train hard. Yang, one year older than Li, joined the national team one year later than Li. Yang played in 4 Worlds, and has 5 world titles. She asked to leave the team, and one main reason is that the team is now developing players for the 2004 and 2008 Olympics, and she feels that her style does not allow her to stay at the top. The national team coaches have carefully reviewed their requests, and they approved their resignation. Coach Cai Zhenhua talked to the two players, and he hopes that after a period of adjustment in Jiangsu, they could continue their training to stay in shape. He believes the system of competition at the national team will get better, and he hopes that Li and Yang can return to the national team, through the proper competitions. The 14th match in the International Challenge Series was played on December 26, 2001, between Liu Guoliang and world number 16 Petr Korbel, in Changchun. Liu won 4-2 (11-point format). In the womens match, Chinas Li Nan defeated Singapores Jing Jun Hong 4-0 (4,6,7,8). Korbel with his forehand attacks won the opening game 11-8. Then Liu demonstrated the pips-out penholder style and also made frequent use of his reverse side techniques to win the next 2 games at 7 and 8. In the 4th Korbel was able to engage Liu in rallies and won. In the critical 5th and 6th games, Liu increased his tempo, moved the ball all over the table, and wore Korbel down. The match was over after a powerful smash by Liu who won the last 2 games 11-9 and 11-5. The fans have seen a Liu with new confidence. The last 2 matches in the series will be played on February 2 and February 23, 2002. Many readers, after reading the previous chapters, would think that Kong had a very smooth career path. But, like everyone who is successful, Kongs road is not a straight one. Compared to Liu Guoliang, who joined the national team at the same time, Kongs emergence was quite a bit delayed. In the 1992 China Open, Liu became famous overnight by beating Waldner and other top players, and was on the 1993 Worlds team roster. Kong did not play at the 1993 Worlds at all. He was just a future hope, with no real accomplishment yet, although his techniques were steadily improving. The event that had a huge impact on Kongs style occurred in September 1992. The national team sent him to play in a Swedish club for the next 5 months. At that time the European style, especially the Swedish style of combining topspin with fast attack, was most successful, and for several years had dominated the Chinese style. Everyone in China was paying close attention to that style, and Kong was one of the young promising players in whom the Chinese wanted to develop a similar style. The coaches felt that to accelerate the improvement in the areas of combining looping with fast-attacks, the players needed to be in closer contact with the Europeans and to learn from them. The Swedish Kalmar BTK club was asking for a Chinese player to join, so the team sent Kong there. Even though Kong had played outside of China before, this was the first time he was travelling alone. He was only 17 years old, and he could not speak any foreign language. Everyone was worrying about him, but the coaches felt that the young players needed to overcome some obstacles to grow up. After deciding to sent Kong abroad, coach Cai Zhenhua half-jokingly told Kong: "There is one thing that is always on my mind. Can you promise to get to Sweden safely? You have to prepare well and not make any mistakes on your way there". Kong was getting nervous. Once abroad, he would not even be able to speak enough English to ask for directions. He had to change planes in England, and he could miss the connection if he were not careful. So he started talking to the older players and coaches to learn about the details in international travel: how to check in, how to ask for help, etc. Kongs mother was away on business in Shanghai at the time. When she learned that her son is going to Europe on his own, she immediately took a train to Beijing. She got off the train and found out that her son had already left for the airport, so she rushed to the airport right away. She found him there, and gave him a stack of index cards. These were cards with common English expressions that she had asked a friend to write for her son so that he could show them when he needed help. Then she asked all the departing passengers to find out if there was anyone who would be transferring to Sweden. Fortunately there was a professor who had the same itinerary, and he promised to make sure that Kong would get there safely. After almost 20 hours of travel, Kong finally arrived in Sweden. The Kalmar club was located in a small town with no Chinese resident. Through the translation of an immigrant from Southeast Asia, Kong found out that the club had placed him in the home of a local resident. Everyday he would need to take a bus to eat at a Chinese restaurant far away, and then travel to a different town to play in the Swedish league. Kong did not mind the living arrangements, but felt uncomfortable about the club schedules: he was asked to play immediately. He just had a long flight, and needed to sleep badly. He was not yet adjusted to the new time zone, and did not have any energy to start playing right away for the club. But even though he did not want to play, he kept that to himself. Despite his best efforts, he found that the club was not satisfied with his performance. He lost his very first league match. That should not be unexpected. The Swedish league had many top players, and Kong did not have any advantage over them. How could he win when he was so tired? But that was not the way the club owner saw it. The club was expecting a top player from China, and they were unhappy that Kong lost. Kong, who had a lot of self-esteem, was feeling hurt. He now understood what it was like playing for a foreign club, and he knew that the times ahead would be tough. He would have to do his best to earn his bosss respect. Every match in the league was a tough one, and Kong lost to many players. But the several months he spent in Sweden had matured him. The Kalmar club had a lot of great players from Europe, and Kong played against Waldner, Applegren, Persson, Karlsson and others. In close contact with these Europeans, Kong had learned their techniques, and he had come to a deep understanding and appreciation of the European shakehand style. When Kong came back to China, everyone was watching him close to see what he had learned. A lot of people did not feel that Kong had changed much; he was still the same way. He was steady but not ferocious, and his records were somewhere near the middle. He was better than some teammates, but not as good as Wang Tao or Ma Wenge. But soon afterwards, people noticed the subtle changes in Kongs style. Now they were saying: "How come Kong now played a little like Waldner?" Of course, the person who was watching Kong the closest was his coach Yin Xiao. Through the changes in they way Kong played, Yin had seen the substance of Kongs new game. He boldly predicted: "Kongs trip to Sweden was not wasted. He is coming up!" The difference between the Swedish style and other European styles was that the Swedish were great in their ability to vary. Waldner was especially good at that. Waldners opponents typically did not feel that Waldner was particularly strong at the beginning of a match. But as the match went on, Waldner would figure out his opponents strengths and weaknesses. Then he would play to create the most awkward situations for his opponents, who would eventually succumb to shots all designed to exploit their weaknesses. The Chinese coaches had a great appreciation for Waldners style: one that was rich in variations of tempo, placement, speed and spin. They felt that Chinese should learn from his style. In the past their inverted fast-attack players relied on the first-3-balls to create opportunities, but they were weak in extended rallies and in transitioning from defense to offense. Now coach Yin could see a shadow of this variation-rich style in Kong. Yin felt that if Kong could use the experience he picked up from Sweden, distill it so that it became instinctive, and then through practice develop a set of integrated tactics and strategies, he would become a world-class player in a very short time. Yin therefore proposed a set of specific goals: perfect the theory, work hard on the practice, and develop a distinctly Chinese shakehand looping style. 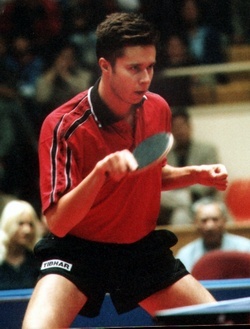 Vladimir Samsonov, the "Gentleman of Table-Tennis", played his first European Youth Championship in 1987 and reached the semi-finals. He was only 11 years old at the time. Since then, he has attracted everyones attention, and has played 14 years of professional table-tennis. Even though he has been very successful, he is still very modest. While we appreciate his superb skills, we also greatly admire his sportsmanship and his manners on and off court. Some even says he is the perfect player. I have interviewed Samsonov 4 times, the first time when he played in the World Cup in 1999. That was my first interview assignment from Table Tennis World, and even though I was nervous, the interview went very smoothly. At the time I said to myself, it would be so great if everyone was as nice as Samsonov! Samsonov treats his fans well. I was deeply impressed during the 2000 World Club Championships. After the match, fans surrounded Samsonov and his teammates when the bus dropped them off at the hotel. The other players broke out of the crowd, with the help of the security people, but Samsonov stayed back to sign autographs. It was a very long line of fans, buy Samsonov signed for every one of them, and he let fans take pictures with him. Although he did not win any Worlds or Olympics title, Samsonov keeps an even emotional keel, and keeps working at reaching his goals. In the 2001 World Cup, the first one using the 11-point format, Samsonov won his second title in 3 years. His world ranking has risen to second place. We hold a special place in our magazine for players like Samsonov. We have used his wedding photo on the cover of an issue, and now we recorded his interview so that we could share his happiness. On September 27, 2001, Samsonov came to China to play a Challenge Match in Tianjin. He was accompanied by his father. Through arrangements made by San-Ding Company they spent the morning touring the Imperial Palace, and left for Tianjin at 1:30 p.m. In order to interview him, I went with them to visit the Palace in the morning. We picked them up at the hotel, and we went to the Palace to shoot some photos for our January issue cover. One our way, we saw the many cars on the streets, and Samsonov commented: " Beijing is huge. I cant remember how many times I have been here. I feel familiarity and closeness with China. My impression of Beijing is that it is big, and it is changing very rapidly. It is truly an international city, but there are too many cars here. Traffic is congested". With that, the interview began. In 1992 I went to Germany as a 16-year-old. I have played professionally in Germany for 7.5 years. Germany is the start of my career, and those years have been the critical years of my life. I actually have lived away from my parents since I was 11. For 6 months or so out of each year I played in the European countries. Since I have lived by myself for so long, I have learned to be independent, as well as accustomed to travelling, very early. Life was difficult for me when I arrived in Germany. I had to take of myself, I did not know anyone, and I could not speak German. After a while, I get used to living there. I started to make friends, and I learned English and German. I can even speak Croatian. For me, learning these languages has been easy because I had to speak those languages to communicate with those around me. I am playing in Belgium now, and they speak French there. I cannot speak French yet, but my teammates understand English and German well. It may be a little difficult for me to learn French. In Germany I played many league matches in a year. When I first arrived, those matches were very important to me because they established my foundation, and I learned through competition against international players. There was an important match almost every week, and it was very difficult for me to win. It was almost unimaginable for a 16-year-old to face that kind of competition. After playing for so many years, I felt that I was very used to living in Germany and other European countries, and my technical skills had matured to the point where I was winning most of the matches. That was when I started to think about leaving Germany and playing in Belgium. In 2000, I transferred to the Belgium Charleroi club, and my whole family moved to Belgium. I now have more time for systematic training, and for taking care of my family. We play one league match every week, and we also play in the major European club events. For me this is a good move. I learned that Samsonovs wife Natasha gave birth to a baby boy in September. I said, "At the 2000 Olympics, you were so sad after losing to Waldner. After the matches were over, Natasha and you were the only people left in that big stadium. She looked at you with affection, and she touched your hair and kissed you. We took a photo of this very precious moment and printed it in my magazine. Many of our readers were touched". Samsonov smiled happily when he heard that. In 1998, I met Natasha in Belgrade, Yugoslavia. I was there to play in an Open event, and she was on the preparation committee. When I first saw her, I felt that she would be my future wife. She was the girlfriend I always wanted to have. Later she told me that I was the one she had been looking for. We met, fell in love, and were married on July 1, 2000. We had our wedding in Belarus. You showed our wedding picture on the cover of one of the issues. Life has been different after we got married. Young people hold a certain amount of doubt for the marriage institution. They worry that marriage will have a negative impact on their life. But I dont think so. I am very happy now that I believe that I will almost enjoy our lives together. In the past I had won many tournaments and still not felt happy. Now even if I dont win, I am still happy. I dont know whether having a family is good for my table-tennis, and I dont know whether winning should be more important than having a family. These are questions with no simple answers. But now even when I lose, I still have a wonderful family life. Of course, as a professional I have to spend a lot of time training and competing. If I dont win when I should, or if I lose a lot, then I will feel terrible; table-tennis is still my career. I just want to tell everyone that before Natasha, table-tennis was the only thing in my life, so winning and losing had a huge impact on the way I lived. But now it is different. I feel bad after losing, but once I get home and I am with my wife, all my problems become much less important. We now arrived at the Imperial Palace, and our interview came to a break. After we took some pictures in front of the Palace, we started our tour. 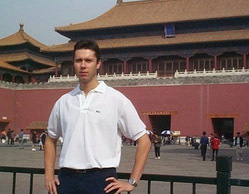 Samsonov said, "In 1995 when I came here to play in the Tianjin Worlds, I visited the Palace. This time I wanted to see the Tian-Tan, but since this is the first trip for my dad, we decided to come here instead". I found that they were rushing a little and appeared a little uninterested. 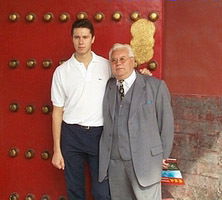 It turned out that the senior Samsonov really wanted to see the Mao Zedong Memorial Hall, and the younger Samsonov wanted to do some shopping. So we did not finish the tour, and went to Tiananmen instead. At the Tiananmen Square, the older Samsonov appeared a little emotional when he saw Maos portrait, and he kept say "Mao Zedong, Mao Zedong". When we were about to go into the memorial hall, Samsonov whispered in Russian to his dad. He told us later that he want to go to Hongqiao Market to shop. His dad looked a little disappointed, but he agreed to leave Tiananmen Square right away. Once we got to Hongqiao Market, they started to shop energetically. I did not know exactly how much they bought, but they had to buy a new carrying case to fit the stuff in. When we left Hongqiao, it was 12:30 p.m. There was only one hour left, so we went back to the hotel to have lunch and to continue the interview. I have an elder sister; she is 13 years older. My parents were quite old when I was born. They had great expectations for me, but they never gave me any pressure. So I grew up worry-free. I loved to think, and I had very good grades in school I am very close to my mother. She had a unique way of teaching me, and that had a big influence on how I eventually turned out. I learned to play chess before I was 7 years old. My dad wanted me to learn chess, but because he was busy, he did not played much with me, and left it to my mother to teach me. She wanted me to play table-tennis and become a professional when I grew up. My father also supported that idea. I was just playing it for the fun. There was a club near my home, and I would go there to watch people play. The coach there felt that I was too young and would not take me as a student. My father had a big argument with him, and finally he agreed to teach me. That was the start of my table-tennis career. There were 10 players in the club, and I was the youngest one. In the beginning we practiced 3 times every week. After a while, my coach found that I had a special talent, and he paid more attention to me. My father almost knew nothing about table-tennis, but he was trying to help me also. He would ask the coach how I should train, and then he would teach me. In 1987, when I was 11 years old, I played my first European Junior Championship and came in third. Since then, I played all over Europe almost 6 months out of every year. In 1989 I won the European Junior Championship singles title. When I was 14, before the break-up of USSR, I received support from the sports ministry. Back then, there was a rule that all national team members would receive special training and education, and even their families would receive a stipend. I have not lived with my parents for so many years. My contact with them was via telephone, and I sometimes visited them. My sister got married early, so I was my parents only concern. Sometime when I was busy and had not called them in several days, they would get very worried. Very regrettably my mother passed away in February of this year. But I will treasure her love forever. Now my father visits me once a month in Belgium. After the birth of our son, my wifes parents also help us take care of the baby. Sometimes when you just finished a match, you are exhausted physically and mentally. You may not be in a good mood. But the fans did not realize that, and they want your autograph, or they want to take pictures with you. At this time, I will try to control myself and calm myself down. I will try to satisfy my fans, especially the younger ones. When I see the see the innocent look in the eyes of the children, I feel love. Sometimes when we take pictures, many flashes may go off at the same time, and I may appear like I am not interested, or in a good mood. I always feel sorry about that. I cannot tell you why, but I always think I should treat all my fans well. In 1999, Samsonov won the World Cup. He has not won any world title since then. His ranking dropped to 7th at one time. Samsonov seems oblivious to these setbacks. I never put pressure on myself, and I do not set very high goals. And winning the Worlds or Olympics title is a very difficult thing. There are so many top players in China, and in Europe as well. I will try hard to do my best, and as to how high I can go, I do not want to put demands on myself. From September 1999 through May 2000 I was world-ranked number one. I am very proud of that. Recently the ITTF has actively reformed the sport: from the bigger ball to the 11-point format, and to next years service rule changes. I feel that no matter how major the changes are, the sport itself is not greatly affected. The top players still will be at the top. I played my first 11-point tournament in Japan. I felt unaccustomed in the beginning. The scores seemed always to be close, and the games seemed to finish soon after they started. And the service change every 2 points disrupted the system. This is a challenge to everyone. Overall I still think that the 11-point game is a good thing, even though the top players all face difficulties. For example in the Japan Open many top seeds were eliminated in the early rounds. But things should get back to normal after an adjustment period. To spectators, the 11-point format is a more attractive one. It was 1:30pm when we finished lunch. Samsonov had to leave for Tianjin, so the interview came to an end. He finally said to me, "The professional player lives a boring life. We do not have that much free time. My biggest enjoyment is to go see a movie. But since I picked this path, I will continue with no regrets". PS: One month later, Samsonov defeated Wang Liqin to win the 2001 World Cup. He beat Wang 4-0, therefore demonstrating his abilities. After that match he told reporters, "This is the best I have played this year".